Sometimes stress management and diet alone isn't enough to keep your acid reflux under control and that's where OTC Antacids come in handy. If you tend to have one too many frozen burritos or spicy chicken wings and feel the burn afterwards, or if you often feel bloated and gassy after meals, we have a product that can help you. We carry over the counter liquid antacids, chewable antacid tablets, and swallowable antacid pills. The Antacid Liquids are designed to be used with feeding tube, and so are suitable to use for gastrostomy patients. If you don't like swallowing pills we also have Chewable Antacids. These are also great for kids or people who dislike or have difficulty swallowing whole pills. 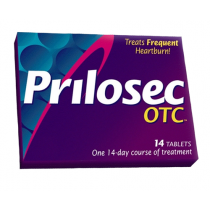 If pills are no trouble for you, omeprazole and ranitidine are both very effective for recurring heartburn. Be sure to follow the directions on the medication carefully, and be sure to consult a doctor if you have chronic, severe heartburn. Not all antacids are the same. We carry multiple antacid types with a number of different active and inactive ingredients. Cal-Gest Chewable Antacid is a calcium carbonate based chewable antacid similar to TUMS. Geri-Mox antacid contains aluminum hydroxide and magnesium. Some of our antacid products, such as Sunmark Stomach Relief Tablets contain Bismuth Subsalicylate and have anti-diarrheal properties. Others like Milk of Magnesia, a mangesium antacid, double as antacid and laxative so be sure to know what the product you are purchasing is used for. If you're just looking for an antacid and nothing else, omeprazole and ranitidine are excellent options to try.